Came across this car dealer in Noshiro, Akita on Street View, with this simple but awesome old school Mazda sign. If I recall properly, this should be from the 80's, after this font of the Mazda name was introduced in ‘75, using this 7x7 blue square signage, before the trio of ɛ̃fini, Autozam, and Eunos were introduced. 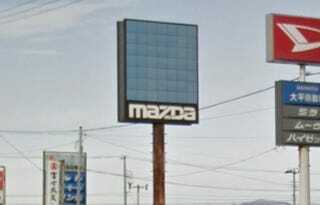 I had actually never seen this kind of Mazda signage before, but I thought it was interesting enough to share.